Prishtina gallery LambdaLambdaLambda will open artist Flaka Haliti’s latest project–a contemplation on the NATO peacekeeping force in Kosovo–Friday at 7 pm. Flaka Haliti presents her art in proverbs. In her latest work, titled its urgency got lost in reverse (while being in constant delay), the riddle guides us to question temporality–reverse, delay, and urgency–in military interventions and the process of demilitarization. At the exhibition’s opening on Friday, we should expect to see “something very sparkling and colorful, as usual,” said Haliti laughing. The 34-year-old artist is based in Munich but returned to Prishtina last month to construct the upcoming exhibition, which will be on display at LambdaLambdaLambda, the Prishtina-based contemporary art gallery run by Austrian gallerists Isabella Ritter and Katharina Schendl. Haliti is known for her artistic statements on power, borders, and nationalism. 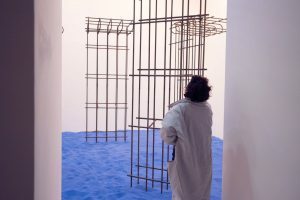 A case-in-point is her 2014 solo presentation for the the Venice Biennale’s Kosovo pavilion, which depicted borders and ‘the blue of the borderless utopia.’ But not all of her works begin or end with Kosovo. “I want to free myself from those exoticizing lenses, [viewers] narrowing my work through exoticizing my background.” She expects her work to be able to open up a more globally comprehensive reading. Its urgency got lost in reverse (while being in constant delay) will be Haliti’s second exhibition at Lambda. The futuristic works will fill the entire gallery space. 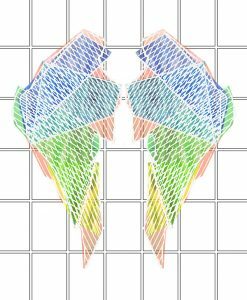 A pair of plexiglass wings inspired by Haliti’s recent residency in Florence will be displayed across from the centerpiece: a robot built of scrap materials from KFOR military camps, engaging with the presence of the NATO peacekeeping in Kosovo since 1999. About three years ago during a trip home to Kosovo, she came across two improvised markets selling these materials, objects as mundane as oven coils and weather-proof flooring. “I was amazed by these materials. I’ve been reading a lot of Avery Gordon—her theory of ghostly matters. Her theory is that everything is haunted by the specter of something,” she said, referring to Gordon’s book Ghostly Matters: Haunting and the Sociological Imagination. The author argues that all objects and aspects of social life and haunted by the past, especially in regards to state-sanctioned acts of violence. “This is a site-specific work that I am doing for Lambda,” Haliti said, which aims to “subvert and transform” materials from the peace-building mission. The works are especially relevant during this moment of contention, with Kosovo President Hashim Thaci defying NATO and pushing to bypass a Serb veto and transform the Kosovo Security Forces into an army, though the artist had no idea that her works would end up aligning with current events, she said. Its urgency got lost in reverse (while being in constant delay) will open on Friday at 7 pm with a ritual performance by fashion designer and artist Ayzit Bostan. It will be on view until May 28th, Thursdays-Saturdays from 2-6 pm.